The latest workmanlike entry in what must be regarded as an unprecedented film series has plenty of flaws, but also the franchise's reliable draws. 138 min. Warner Brothers Pictures. Director: David Yates. Cast: Daniel Radcliffe, Emma Watson, Rupert Grint, Ralph Fiennes, Gary Oldman. Harry Potter and the Order of the Phoenix tends to be high tension and low fun, but that's its lot in the Harry Potter saga, as laid out by author J.K. Rowling. 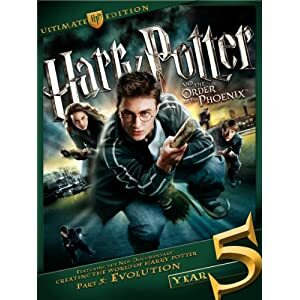 The Harry of Year Five confesses to being angry all the time, and for good reason: a magical war is brewing that promises once more to pit him against Voldemort—that is, if the Ministry of Magic's bureaucratic poison doesn't do him in first. The latest workmanlike entry in what must be regarded as an unprecedented film series has plenty of flaws, but also the franchise's reliable draws—the latter continue to make Potter a safe bet for a broad swath of kids and young adults. Potter's initial doldrums come when he's unjustly charged with using magic in front of a Muggle (and if that sentence doesn't make any sense to you, you may as well give up now). Having succumbed to political paranoia, Minister of Magic Cornelius Fudge (the impeccably blustery Robert Hardy) targets Harry and Dumbledore (Michael Gambon) as political enemies spreading sacrilege: that powerful dark lord Voldemort (a.k.a. He-Who-Must-Not-Be-Named), presumed gone for good, is back with a vengeance. Harry eventually makes it back to Hogwarts School of Witchcraft and Wizardry—and friends Ron Weasley (Rupert Grint) and Hermione Granger (Emma Watson)—but, as usual, his trouble is just beginning. The latest Defense of the Dark Arts teacher—the wizarding equivalent of Spinal Tap drummers—is Dolores Umbridge (Imelda Staunton, fearsome and fanciful), a conservative nightmare whose appointment has obviously been pressed by Fudge. Her philosophy to teach magic only in theory and not in practice briefly turns Harry Potter and the Order of the Phoenix into a fascinating bit of pedagogical debate: to kids rightfully fearing the business end of a wand, a prep school should better prepare them for real-world snares. Before you can say, "Expelliarmus!" Fudge names Umbrage High Inquisitor, and the Order of the Phoenix is girding not only for Voldemort (Ralph Fiennes) but a magical civil war. It's hard to know how closely teens Harry's age (by my count, he's fifteen) will relate to his latest adventure. The seething at adults' condescending injustices toward teens will resonate, as may the withholding demeanors of father figures. The drama amongst the kids themselves is strictly 90210 this time, and noticeably crowded out by more pressing plot demands (Harry's much-hyped first kiss takes up a few minutes—the act and the debrief with his friends—plunked down in the middle of hours of intrigue and breathless argument). Harry learns it's better to get by with a little help from his friends, which adds what little novelty there is to the predictable Voldemort-facing climax and its frenzied storm of action. It's an unyielding structure—summer set-up, troubling school session, Christmas break, more studies, and a Voldemort showdown—and no one can be blamed for tapping one's foot a bit as it all plays out once more (with two more rounds on the way). And aside from Harry letting his friends in to his headspace and crises, the characters don't grow much this time out. Surprisingly, Neville Longbottom (Matthew Lewis) is the character who shows the most new shadings (fuelled by wrath at his parents' murder, he's coming into his own as a magician). Director David Yates (State of Play), in his first Potter effort, makes good use of two classic cinematic techniques: the newspaper montage (goosed by The Daily Prophet's moving pictures) and the flashback (with Radcliffe now 17, there's a charge seeing him recall his twelve-year-old self). I mentioned earlier the series' reliable draws. The first is its huge, and growing, cast of characters, particularly those played by the U.K.'s finest: add to the aforementioned Helena Bonham Carter, Robbie Coltrane, Warwick Davis, Brendan Gleeson, Richard Griffiths, Jason Isaacs, Gary Oldman, Alan Rickman, Fiona Shaw, Maggie Smith, David Thewlis, Emma Thompson, and Julie Walters. The next draw is production-design spectacle, and though the thrill is diminished from earlier entries, Order of the Phoenix is still a handsome adventure (my favorite images: Umbrage's collection of pink-rimmed kitty plates, and the climactic setting of the Department of Mysteries). Third: you've heard of interpretive dance? Harry Potter is full of interpretive special effects. (The term cuts both ways. Too often viewers must interpret what they're looking at: one character fades gently into space, another disappears into a fireball—the former is, supposedly, dead; the latter is just transporting himself in style.) Fourth: for Potter-holics, the films bring to life books pored over (and over) at length. This, too, cuts another way; casual readers of the books and viewers of the films had better pay damn close attention (for the record, this film's screenplay is by Michael Goldenberg, who penned 2003's Peter Pan). Harry Potter and the Order of the Phoenix is essentially a "critic-proof" film: is anyone in the world really on the fence about seeing it? If you're going, keep your expectations moderate, and you'll be fine. If you're not going, it's no doubt for good reason. Yates does a respectable job of keeping the torch alive, and obviously Warner Brothers, the core cast, and Rowling are pleased: Yates will return to helm Harry Potter and the Half-Blood Prince. Warner continues to go all out with its Harry Potter Ultimate Editions. Year 5—a.k.a. Harry Potter and the Order of the Phoenix—comes in a big ol' box with lenticular slipcover, the latest two collector cards, access to a Digital Copy of the film, and the hardcover book Creating the World of Harry Potter: Evolution. Of course, it also comes with a top-notch A/V presentation. The highly detailed hi-def transfer yields plenty of texture and features a rock-solid black level. Color is accurate and rich, and the image achieves considerable depth. The DTS-HD Master Audio 5.1 mix is more than up to the film's many sonic demands. Careful separation spells wonderful immersion, with dialogue always nicely prioritized and clear. Disc One includes an In-Movie Experience hosted by Daniel Radcliffe and loaded up with picture-in-picture pods. The Focus Points (1:03:00, HD) can also be accessed from the main menu: "Dementors at Little Whinging" (3:40), "Grimmauld Place" (3:04), "Tonks' Face Transformation" (1:54), "The Ministry of Magic Atrium" (3:00), "Neville's Cactus" (1:10), "Rupert's Giggle Fits" (1:23), "The Paper Swallow" (1:30), "Professor Umbridge" (2:09), "Professor Umbridge's Spies" (1:30), "Professor Umbridge's Office" (2:24), "The Thestrals" (3:05), "Hog's Head Tavern" (1:06), "The Room of Requirement Door" (1:32), "The Room of Requirement" (2:25), "The Inquisatorial Squad" (1:39), "Harry and Cho Under the Mistletoe" (2:16), "Kreacher" (3:10), "Azkaban Prison" (1:41), "The Mirror Explosion" (1:58), "Grawp" (1:48), "The Weasleys' Fireworks Display" (3:02), "The Explosion of Decrees" (1:57), "The Centaurs of the Forbidden Forest" (3:37), "The Centaurs Take Professor Umbridge" (2:06), "The Thestral Flight" (1:52), "The Hall of Prophecy" (2:41), "The Choreography of Magic" (2:17), and "A Wizards' Duel: Voldemort vs. Dumbledore" (3:02). Disc Two houses the new documentary (or, rather, new segment of an ongoing documentary) Creating the World of Harry Potter Part 5: Evolution (57:16, HD), which focuses on design elements of the films. The 2007 TV special "Harry Potter and the Order of the Phoenix: Behind the Magic" (46:46, SD) is a making-of made in a promotional style. "Building the Magic: The Sets of Harry Potter" (20:22, SD) examines Grimmauld Place, Dolores Umbridge's office, the Room of Requirement and the Ministry of Magic from design and construction standpoints. "Harry Potter and the Order of the Phoenix: The Rebellion Begins" (23:13, SD) focuses on the story and characters. "Harry Potter and the Order of the Phoenix: Fulfilling a Prophecy" (13:02, SD) does much the same—nothing to see here, folks. "Trailing Tonks" (19:25, HD) follows actress Natalia Tena around Leavesden Studios. "Harry Potter: The Magic of Editing" (5:21, HD) allows director David Yates and editor Mark Day to give a kid-friendly tutorial on film editing; it's also interactive, allowing kids to try their hand at piecing together a scene. Nine "Additional Scenes" (10:57, HD) include "Professor Trelawney eating in the Great Hall [extended]" (2:44), "What Neville heard about the Daily Prophet [extended]" (:17), "Students in Gryffindor Common Room [extended]" (:30), "Professor Umbridge evaluates Professor Trelawney [extended]" (2:50), "Malfoy, Crabbe and Goyle bullying" (:21), "Filch blows out Professor Umbridge's hair" (:25), "Harry, Hermione and Professor Umbridge in the Forbidden Forest [extended]" (1:53), "Harry enters Professor Dumbledore's office" (:41), and "Harry packs and talks with Ron" (1:11). Last up are the "Trailers" (3:14, HD): that'd be the "Teaser Trailer" (:59) and "Theatrical Trailer" (2:14). Whew! Potter lovers will have hours of fun with this set, over and over again, and it does indeed seem a legitimate Ultimate Edition that will retain the name for some years now (until the inevitable anniversary editions come back for more!). All site content © 2000-2019 Peter Canavese. Page generated at 04/18/2019 09:53:36PM.